For example, the height of the barcode image is set to 1 cm but after it is created it is 3 cm tall. As another example, a 300 DPI image is created and imported into other software or displayed on the screen where it appears 3 times larger than it should be. 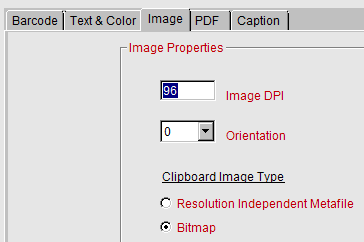 Choose 96 DPI if possible when creating images, unless higher resolution is necessary. If the IDAutomation Barcode Image Generator is being used to create static barcode images, the image can be pasted into the application or imported and then sized accordingly. Import the image into a graphic application and define the size of the image in the application itself. For example, import a 600 DPI JPEG into PhotoShop and define it as a 600 DPI image. When creating barcodes for display in the web browser, the HEIGHT and WIDTH tags may be used to properly size the image. Please refer to the document about achieving precise X dimensions in the printed barcode using HTML.